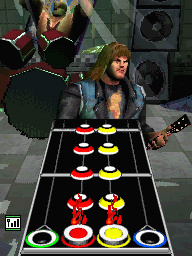 Sorry, no review of Guitar Hero: On Tour yet. For the first time, handheld gamers have the freedom to unleash their inner rock star anytime, anywhere with Guitar Hero®: On Tour. 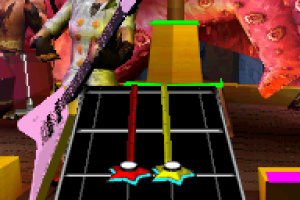 Utilising the revolutionary Guitar Hero™ Guitar Grip™ peripheral that fits snugly into the Nintendo DS and a unique Guitar Hero pick-stylus, Guitar Hero: On Tour brings a new dimension to handheld gaming and gives fans the ability to shred along with their favorite tunes with complete portability. 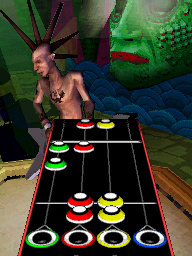 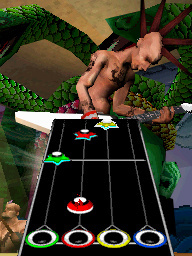 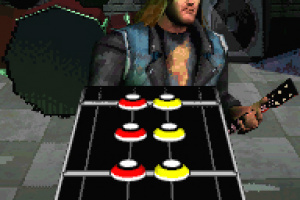 The game delivers a unique experience by challenging handheld gamers to rock out and prove their shredding skills on the most diverse set list of master tracks ever offered in a Guitar Hero game, including classic rock, alternative and pop favorites. 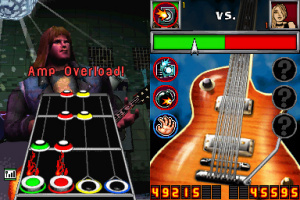 Rock out anytime, anywhere – Fans can now take the Guitar Hero experience wherever they go with Guitar Hero: On Tour. 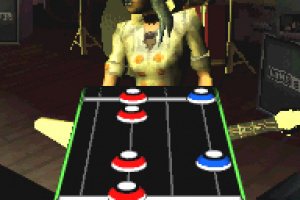 The Guitar Hero Guitar Grip is an ergonomic extension that mimics a guitar fret board and fits seamlessly in people’s hands to deliver the same core gameplay that defines Guitar Hero. 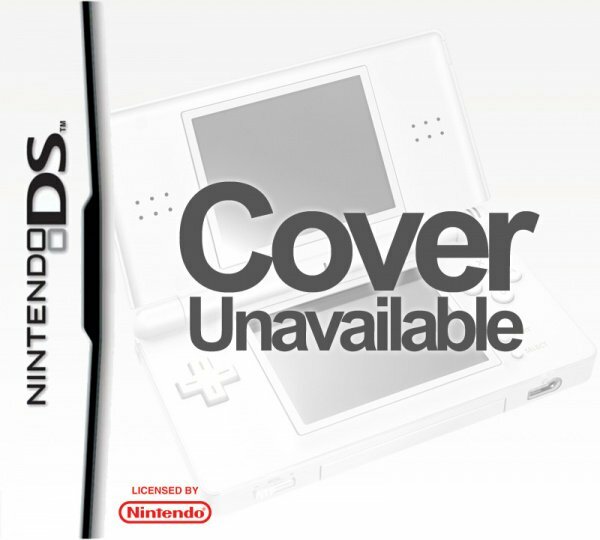 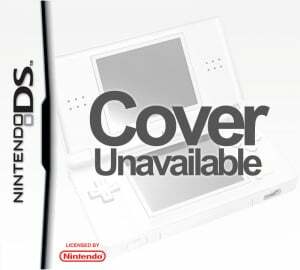 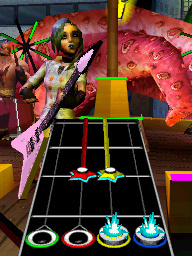 Strum with the stylus – Included with the game is a new Guitar Hero pick-stylus that allows gamers to strum away in style on the touch activated screen of the DS. 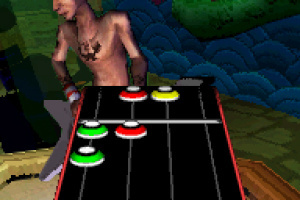 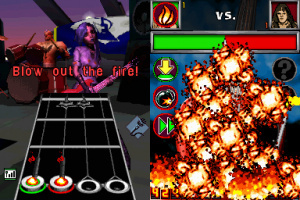 Jam with friends – On a local wireless network, friends can join together to play in co-op mode, or challenge one another in a Guitar Duel using new battle items unique to the DS platform. 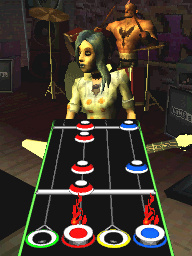 Become a rock legend – Players can blow into the microphone to extinguish a pyrotechnics effects gone wrong, or use the touch screen to autograph a fan’s shirt in the middle of their set. Personalize your experience – With a vast collection of Gibson guitars, five unlockable venues and six characters to choose from – including two new rockers exclusive to Guitar Hero: On Tour – gamers can personalize their Guitar Hero experience to their heart’s desire. 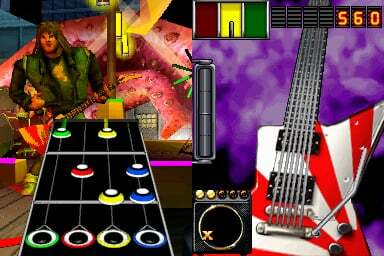 Pick a song, any song – Fans can prove their shredding skills on the most diverse set list of master tracks ever offered on a Guitar Hero game, including classic rock, pop and alternative favorites such as Nirvana, OK Go and No Doubt.